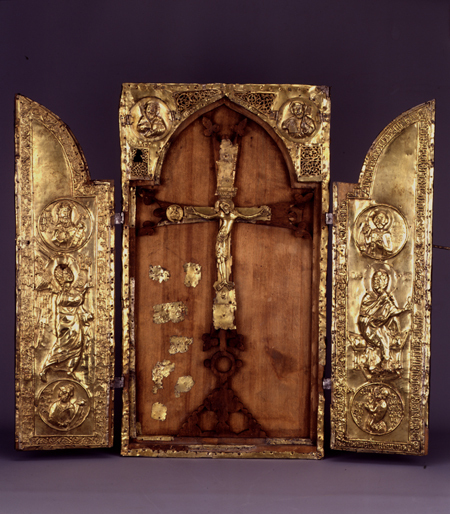 Home » Archaeology » Armenian Reliquary 1293 AD. This folding reliquary icon from one of the Cilikian monasteries is a marvelous work by a medieval Armenian craftsman (the Cilikian Armenian Kingdom existed from the 12th century to the 14th, on the north-eastern shores of the Mediterranean). It was commissioned by Bishop Constantine to commemorate the defenders of the national sacred site, the fortress of Romkla, ruined by the Egyptian Mamelukes in 1292. The themes and personalities depicted are taken both from the Old and New Testament and represent contemporary events and heroes from Armenian history. The Skevr Reliquary of 1293 from the collection of the State Hermitage Museum is a wonderful monument of apllied art of Armenia. 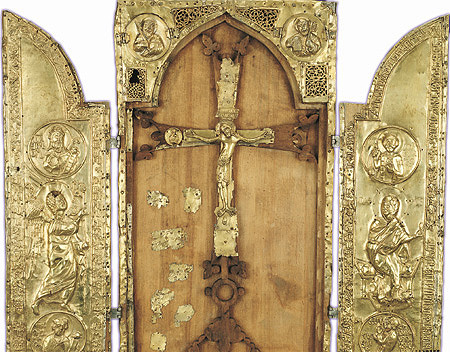 The reluquary consists of three parts – a nut-wood container for keeping relics and two folds to cover the container.The space around the cross with the figure of crusified Christ in the central part of the reliquary is filled with a tar mass in which the relics of saints mentioned in the inscriptions are symmetrically arranged. The folds inside are decorated with scenes of Announciation and figures of three saints and a king Hetum II in the medallions. The poem at the back of the central part tells that the reliquary was executed in Skevr in 1293 by the commission of the Father Superior of the Skevr cloister Constandin. For more than 500 years from the moment it was made in 1293 till 1828 when it was found in Italy the reliquary was kept in obscurity. The first mentioning of it in modern history dates back to 1828 when information about this monument was published by Baron Papaziants, an interpretor of the diplomatic representation of Sardinia in Constantinopol. At that time the reliquary was kept in the Dominican monastery of Bosco-Marengo not far from Alexandria in Piedmont. Later it appeared in the collection of Basilevsky and in 1885 together with the whole collection was acquired for the Emperor’s Hermitage. 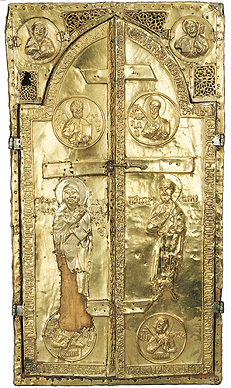 In 1900 the reliquary was restored in the Hermitage Museum. Next Article Silver medallion 2nd c. BC.